Be it for office presentation or for a movie date, projectors helps to view the desired files in a screen. Thus, one can see a bigger as well as clear version with the use of projectors and screens. 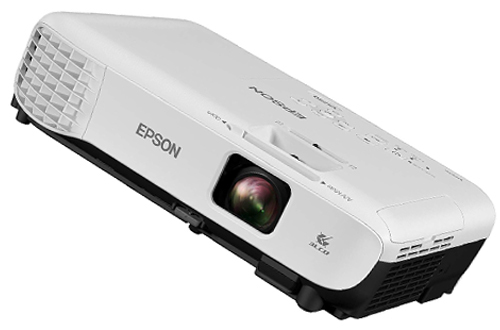 However, portability has been a major issue in the traditional projectors. 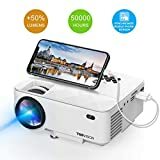 So, portable projectors were welcomed in the market for convenience. With upgraded features, one now gets inbuilt speakers, noise cancellation etc. In addition, the cooling technology prevents the unwanted overheating and you can continue with an uninterrupted experience. 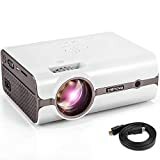 As new additions in technology are made every single day, we have listed the praiseworthy best portable HD projectors for presentations, watching a film, powerpoint etc. 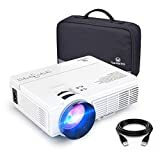 This LED projector for gaming from DR. J is so compact that it is roughly the size of your palm and truly grants you portability, unlike other bulkier products. Firstly, it has grill openings to let out excess heat in order to increase its longevity. One also gets a fan which aids in heat expulsion. However, its incredible technology is capable of doing that efficiently without making too much noise. You get several connectivity options including HDMI for your PlayStation, smart TV and even support TF cards. Furthermore, you can also connect flash drives through the USB port and has standard 3.5 mm headphone jack support. As a matter of fact, the best part about this projector is its superior lens technology. The third generation short-axis optic unique technology gives you better and vivid picture quality and penetration. You don’t need to carry an additional speaker either. It has a powerful stereo sound which will help to get both crisp clarity and volume. Improved brightness, more overall lumens with brightness. It features an advanced LCD lens that comes with 5 layers. Accurate colours with 2000:1 colour contrast ratio. Diffused light doesn’t get you fatigued even after hours of binge-watching. 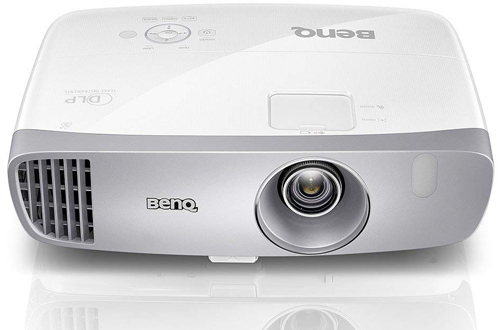 Now, experience true theatre quality entertainment at the comfort of your home with the BenQ HT2050A projector. With the use of a special technology of CinematicColor, this brings out the colours of your projection as it was intended to be. Get great contrast and vivid visuals that are enhanced by the RGBRGB colour wheel with 6x speed and high contrast ratio. 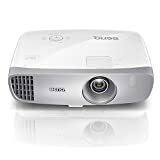 Gaming nights won’t be frustrating and you will have a smooth thrilling experience with this projector. Moreover, it has extremely low input lag as well as readily displays the action you want from your controller. To extend the life of your projector’s light source, you can use the SmartEco or Economic mode. This doubles its life and consumes less power and requires only a one-time set-up too. 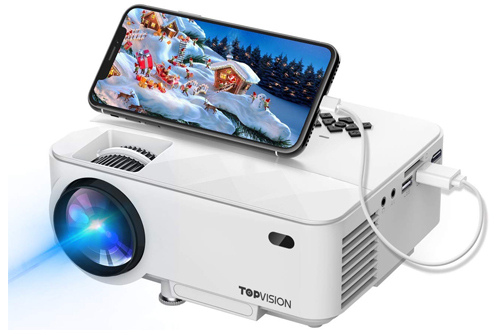 Even, the portable home theatre projector has long battery-life of 7000 hours and the focus of the device’s lens can be adjusted easily. 100-inches of projection width from just 8-feet. Can be used at indirect angles too since it has 2D Keystone technology. A contrast ratio of 15000:1. The big complain that you will have with most projectors is compatibility issues. With the Epson VS250, you won’t be facing such situations anymore. As mentioned, it easily connects with loads of devices including your smartphone, tablet, Apple or Roku TV, Digital camera, DVD player and more. 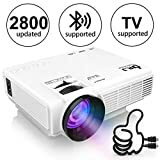 Further, the portable projector’s HDMI port aids to take high definition input from your PC, console or also your smart TV. 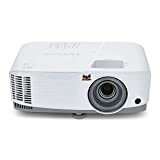 The next big advantage is that the projector displays high-quality images even when you are present is well-lit rooms. It is extremely compact being just 12-inches in width and 9-inches in length. In fact, you can carry it with you on camping trips, to your office or any other place you like. You just need to press the given W button to have an enlarged image and the T button for reducing it. 3200 lumens of white brightness and colour. Comes with remote control and other necessary cables. 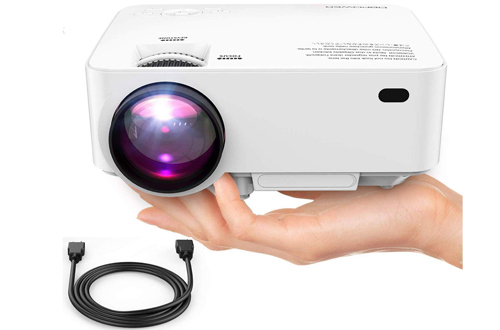 A very small portable projector of 4-inches that packs a huge punch is a very compact package. To start with, you get 2200 lumens and 2000:1 contrast ratio those results in bright and clear picture quality. You get all the ports that you will need including USB ports, HDMI port, memory card port and more to connect your favourite devices. Also, the projector has a dial to adjust the focus of the projector and get the best picture quality. With a 5W inbuilt speaker, it supports 720p as well as 1080p and can also be mounted on the ceiling. Plus, the lamp life of 50,000 hours and 2400 LUX brightness cannot be ignored. Simple and easy to use remote that operates with two AAA batteries. Ships with HDMI and A/V cables. The projector can be positioned to your requirements with adjusting stand. Good projectors are hard to come by. Even if their picture quality is good they have some additional attributes like noise and heat issues that spoil the experience. 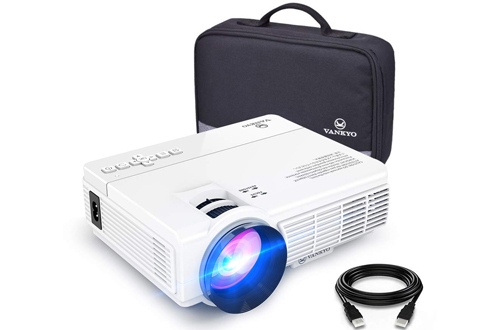 You won’t face those problems with this great projector from Vankyo as it has a cooling system. Thus, it keeps excess heat under control and is equipped with a noise reducing technology. Further, your viewing experience is enhanced by many folds with the built-in dual speakers that give you complete entertainment. Nevertheless, it has a new improved design that increases brightness more than half compared to previous models. It is readily compatible with your smart entertainment gadgets like the Fire Stick, Android TV and gaming consoles like the PS4. And 2000:1 contrast ratio, as well as 60% more brightness of portable movie projector, will make it all better. Keystone can be adjusted either way up to 15-degrees. Can display full HD resolution. 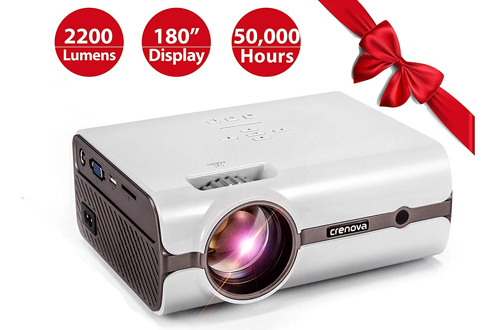 Experience cinema-like you do in theatres with the huge display capabilities of the DBPOWER Mini Projector. Just for a distance of 1.5m, you can get a big projection of 32-inches which can be extended to 176-inches from 5m. With its support for 1080p resolution and high brightness, you can view clearer, sharper images as well as more fluid scenes. Even the lamp life is impressive to last you for years. Moreover, if you are a movie buff who likes to watch a full-length movie every day you can get around 50,000 hours of lamp life. Also, it produces minimal noise and the cooling technology makes it extra durable. Apart from the impressive image quality, you get best-quality speakers. 6 lenses which are coated with a substance to increase transmittance. Dual speakers that deliver theatre like experience. Two fans expel heat and increase the longevity of the device. You get vivid picture quality and immersive listening environment with the Vankyo Leisure 510. Their projection size alone is enough to give the competition a run for their money. You get amazing cinematic experience with a huge 200-inch projection screen that gives you unmatched cinematic viewing. Then again, get an experience similar to surround sound due to its two stereo speakers of 3 watts that have unbelievable clarity. It has a grand lamp life which keeps you away from the replacement for a good 10 years even after you watch 4 or 5 movies each day. Above all, apart from assuring 80% brightness, it supports various multimedia formats as well as connection. Two dials for focus and portable projector keystone adjustment. You won’t miss any details with the HD resolution. Projection size between 44-inches and 200-inches. 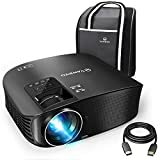 The high-quality technology in this projector throws out awesome images that are superior to anything you have ever seen. This projector has a mirror display that is a better technology than traditional projectors. Also, the ±15 keystone is easily adjustable along with the focus ring and the use of tempered glass lens assures thermal stability. Now keep the projector cool with the cooling system and the noise minimization helps to maintain a peaceful surrounding. Furthermore, you can even project whatever is on your Android or iPhone through this convenient projector. Coming with remote control, the speakers will enrich the sound. 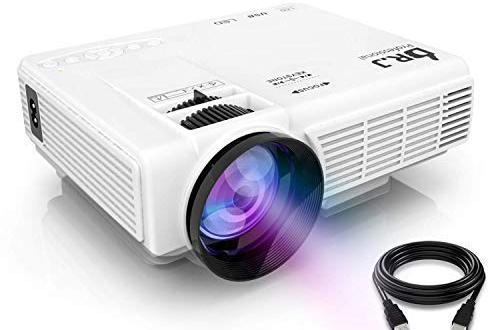 You don’t need to buy HDMI or AV cables since they come with the projector. 50,000 hours of lamp life. The festive season may be over but it still isn’t too late to treat yourself to a projector that can enhance your binge-watching sessions. 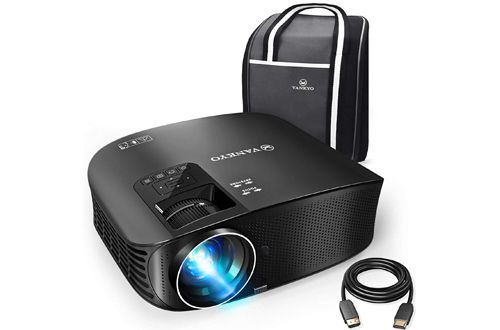 This projector has advanced, versatile features and affordable enough to not drill a hole through your pocket. It has a 1.1x optical zoom lens that enables it to project a large screen from a shorter distance. With the Super Eco Mode, you can stretch lamp life up to 15000 hours. Warranty on this product is a pleasant surprise. 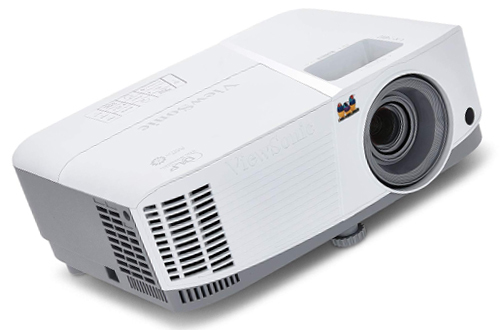 Plus, the SuperColor Technology features 6-segment colour wheel and improves the image quality with 3600 lumens. Instead of the traditional 1 year period, ViewSonic offers a 3 year period on labour and parts other than a lamp. Has HDMI 1.4, VGA ports and even a mini USB port. The 3D Blu-ray HDMI input is indeed a boon. Comes with a remote for hassle-free operation. 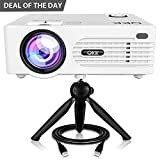 Just the picture quality of this projector makes it a steal deal and a better alternative than cheaper products that flood the market. Experience real-life like colours and avoid blurry edges with this portable video projector. It has a high-quality LED bulb that lasts longer, draws in less power and provides brighter images. Can be easily connected to MAC, Samsung, Google etc, the 200 LUX and 50000-hours lamp life will never stop to have a fun-filled night. 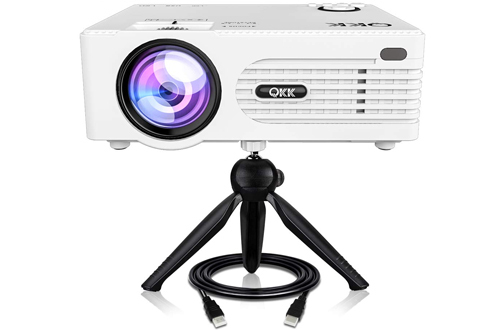 Furthermore, the quite portable projector produces 50% less sound and the 2200 lumens guarantees vibrant images. Also, the LED Technology is pretty advanced thus, less energy is consumed. No overheating as installed with cooling as well as fan system. SRS sound with 5 W speakers. 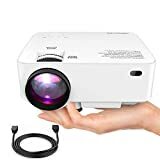 The features of these projectors vary and so, the portable mini projector on sale must be carefully assessed before making the final decision.